So, equipped with the dogs and their passports, we approached the Eurotunnel terminal at Calais not really knowing what to expect. But, it couldn’t have been easier. The signs are clear as you enter the terminal – you must visit the Pet Passport Control before you go through the checking in booths. As you approach the booths, a Pet Passport sign directs you down a slope to the right into a carpark, on the left of which is the Pet Passport Control Office. You take the dogs and their passports to the office where the Passport Officer double checks the entries in the passport and checks the chip numbers of each dog. I was asked to use the chip reader myself on the dogs and then pass the reader back to the Officer for him to check the number against their passports. Once he was happy with everything, he gave me a certificate to say that they were eligible for re-entry into the UK and a notice to stick onto the windscreen. Then, it was back to the car and through the gates to catch the train back to England. The Eurotunnel experience wasn’t quite as fast as from the UK to France because there was quite a queue at Passport Control which held us up a bit. But, once we were on the train, the journey was smooth and we were driving on the left again within 35 minutes! 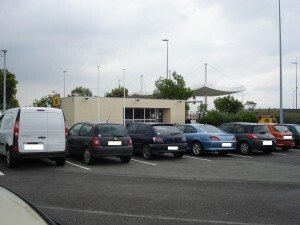 In total, we arrived at the terminal on the French side at 12.15 pm and were driving in the UK an hour and a quarter later. The dogs slept through it all! 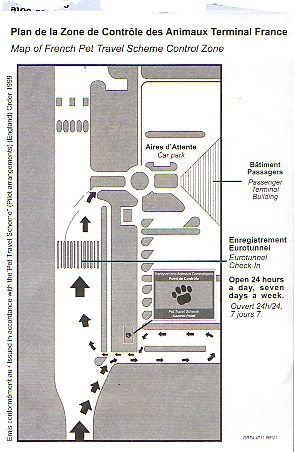 Layout of the Eurotunnel Terminal at Calais including the location of the Pet Passport Control building. This was a sticker we were given to put on our windscreen to say that we had gone through Pet Passport Control successfully. The Pet Passport Control Officer gave us this certificate to confirm that the dogs had passed through the Pet Control procedure successfully. Thanks so much for this post – very helpful. We are travelling back to UK later this week with our Llasa Bertie & want to catch the 7.00 pm train – did you notice opening times for pet passport office? Good news-when we travelled the office was open 24 hours to match the trains. Please can you advise, information my dog is currently going through quarantine in France, I am already llving in the uk. My dog is being brought to the port in France with his passport, is it nesssesary for me to travel to France or can I wait on the uk side for him. The person bring him will have all the current documentation with him, being the owner and my name on the dogs passport, is it nessesary for me to cross the channel. Thanks so much for the helpful info posted on your site. I am returning to the UK in Jan/Feb 2012 with my beloved pooch and am more nervous about getting to France and having the right paperwork for him than I am about the whole finding somewhere to live & work in the UK!! I understand that as of Jan 2012 he can travel without the 6 month blood test providing he has had his Rabies vaccination within 21 days (he had his last in March 2011), but do you know if I need to have any further certificates or documents with me? He has his passport and had had all his required jabs for Spain (incl Rabies) yearly. Any advise you can give me would be most appreciated. Keep visiting the Defra website – things still seem a bit up in the air. The pet passport is the only bit of documentation, but at present a vet will have to stamp it 24-48 hours before you enter the UK. Not yet clear whether this will be needed next year. Hi thanks for the info.. got a question for you. When you went with your dogs did you have the blood test done 6 months before or did they not ask for that as the rules are changing in the next few months.? bit stuck at the moment i need to get back ASAP but havent got my dog blood tested. Hi. We had ours done years ago so I can’t advise. I bet your vet or DEFRA could advise. Good luck. On 30st of June Defra published new import requirements for dogs, cats and ferrets. Between now and the end of 2011 you can only travel into the UK if your dog passed the blood test, and at least 6months has passed between Jab and date of travel. So if you haven’t had a blood test done yet – your dog won’t be able to enter the UK until 1st Jan (which is the situation I’m in with my Border Terrier). Of course you still need the rabies jab evidence in the passport. does any one know what restrictions there are to take a dog out of the country to france? we have got our pet passport less than 21days ago and are aware that we cant return within that but what about leaving? i am hoping if there are no checks from the uk out that we shoudl be ok! I am traveling to UK with 2 dogs on French passport. Is the system the same? DEFRA say Step 4 – Tapeworm treatment – (dogs only): before entering the UK, all pet dogs (including assistance dogs) must be treated for tapeworm. The treatment must be administered by a vet not less than 24 hours and not more than 120 hours (1-5 days) before its scheduled arrival time in the UK. There is no mandatory requirement for tick treatment. Do I need to repeat this to bring them back to France? The checks and tapeworm treatment are only necessary for the entry into the UK. hi we are in same situation . were you able to travel to france ? did they check the dates ? great blog much information gathered. i have a question .im collecting my show dog ive just purchased from calais eurotunnel end. ill be travelling from the uk to calais and was wanting to know can i park my car in the pet controll car park and wait for the dog been delivered to the pet control building car park. and is thiere easy access back on the motorway for the previous dog owner to travel back to poland. 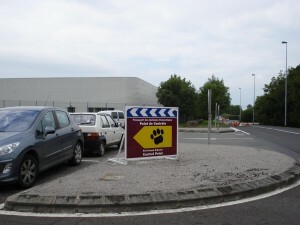 The Pet Control building is found before you go through check in onto the Eurotunnel. I’m sure you can just drive into the car park and then just drive out again back onto the access road. But I would get in touch with Eurotunnel and ask them yourself just to be 100% sure (just in case the access road in was one way and I just never noticed because we were on our way out of France!). I will be taking my cat to UK in March. I wanted to ask where was the check done – is it in a separate room only you with the pet and the officer? or is it a room full of animals? I’m just afraid that if i open the box, my cat will be scared and run away. 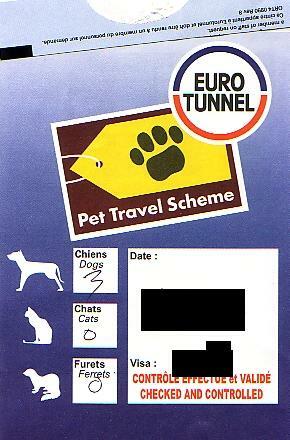 If you’re referring to Eurotunnel, the check takes place in a reception area along with everyone else (including dogs!). They only need to hold the scanner over the animal though to check the chip so you’d just have to hold on tight!! I’ve never seen a cat being checked though so maybe someone else has other advice. Perhaps they have a special ‘cat’room bearing in mind that cats and dogs aren’t always best friends. The clinical examination page is not always scrutinised by the Eurotunnel control (can’t speak for the ferries) but your vet should complete it in any case because there seems to be an expectation for it to be completed. 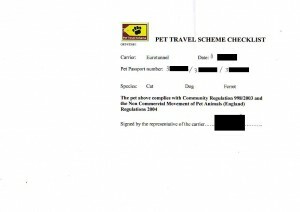 Once that page is full (as there is only one page set aside for this) the vet will simply use the next page (Legalisation) – both the French vet and the Eurotunnel control confirmed this. When we last visited France, the pet control officer at Eurotunnel did say he would expect the clinical examination to be completed. We were told yesterday at the Calais Eurotunnel control that the ‘fit to travel ‘ section was no longer needed and only Tapeworm treatment needs to be certified on the dog’s passport now. But be warned! Our Italian vet had forgotten to put the time down and we were told that had we not arrived more than 24hours before the five day limit we could not have travelled. hi im looking for a vet in France so i can take my dogs over with me, but not sure how to find my local as i have not done this befor and my French is not very good.we are in berni, so hope any one would be able to help. This is certainly way too late a reply for your question but this link may help others with a similar problem. All Vets have been recommended within the last few years by Motorhome owners bringing their pets to Europe and complying to the Pet Passport regulations on their way back to the UK. My name is Max and I have a question. Last month we traveled to Dover from Dunkirk with our dog. We had all the documents and we visited a vet to get a medication from worms. On arrival to Dunkirk and before boarding our ferry, we checked in with french authorities. The chip, pet passport and required vaccination was checked and we received a sticker, that we had to desplay on a windscreen. Does anyone know did we had to report our dog to any UK authorities in Dover? No you’re fine – the checks are done on the French side before you cross the channel. I am moving from the US to the UK. It is horribly expensive to bring my dog because she is required to go as cargo and then there is a PBS fee for customs clearance (another 385 pounds). It is much less expensive to have her come with me as baggage to France and then drive to the UK. Is there a “customs clearance” charge at the border of France and the UK? Thanks! There’s no customs clearance charge, however you’ll need to pay a fee for the dog, usually it’s about £15-20 for the Eurotunnel or ferries. Do you think they will consider it as EU trade even if the dog was coming from the middle east 10 days before entering in UK ? Just travelled from Calais to Dover on the ferry with the dog and it couldn’t be easier. After French passport control and uk border control you declare the dog at check in……..there is no pet reception at Calais ferry port. After handing over the pet passport I was asked to scan the microchip. This was checked against her passport. With everything in order the paperwork to travel was issued and we were given a large yellow sticker for the windscreen which has to remaining there until you exit Dover. Had 3 weeks away travelling through France to Italy and have found everywhere to be extremely pet friendly. Just wondering how much time to leave before the return train to allow for the pre-journey pet passport check? In other words, how long before our train time should we arrive at the terminal? So,we will just get the tapeworm treatment 4 days before our ferry. My question is – do I need to factor some additional check-in time for our dog the we arrive at the port?